A two day symposium marks the official release of Open City: Existential Urbanity, an anthology of student work from the Architecture of the City studio, conducted by Professor Diane Lewis and a team of notable architects at The Irwin S. Chanin School of Architecture. Focusing on work from 2001 to 2014, the book features drawings, models and project descriptions that regard any contemporary intervention into the city as an integral work of architecture, art, and sustainable infrastructure. Essays by members of the faculty and other distinguished thinkers and practitioners accompany the works. The book is edited and designed by Professor Lewis and Daniel Meridor, instructor. 10:45 a.m. - 11:30 p.m.
12:40 p.m. - 1:40 p.m.
3:35 p.m. - 3:45 p.m.
Open City builds on the tradition of two earlier publications entitled Education of An Architect: A Point of View (1972) and Education of an Architect (1988), which established the internationally influential curriculum that begins with Architectonics, the structural and spatial vocabulary of architecture, and demonstrated the unique impact of that foundation on the five-year degree program at The Cooper Union. The subtitle “Existential Urbanity” reveals the underlying interest in the neo-realist concepts of the Italian Cinema and its parallels in architecture: the architectural art of cultivating the “text” of an existing place into the significance of the form and use envisioned for an open space and civic institution. The anthology represents drawings, models, and texts for works of civic architecture. Each of the project proposals considers the architectural memory of a given site as inspiration to the design of the structural form and the humanitarian program proposed. This unique study of the city advanced at The Cooper Union presents a strong picture of a generation’s cutting-edge civic activism, poetic vision and concerns about sustainability, which are aptitudes identified with the legacy of this architecture school. Apropos of the theoretical roots and the poetics of this approach to the city, Richard Meier, Barry Bergdoll, Curator of Architecture and Design at MoMA, and Diane Lewis contributed the introductory essays with an epilogue by Professor Anthony Vidler, Dean of the School of Architecture from 2001 to 2013. The introduction also includes essays by Peter Schubert and Francois de Menil. The illustrious and diverse roster of the team who participated in teaching this design studio with Professor Lewis whose essays introduce each studio chapter include the architects Peter Schubert, Georg Windeck, Mersiha Veledar, Roger Duffy, Calvin Tsao, Thomas Tsang, Daniel Meridor and Robert Estrin, and the historian/theorist Daniel Sherer. Texts by diverse contributors such as writer Fran Lebowitz, and Karen Wong, Deputy Director of the New Museum, powerfully frame the overarching philosophy of the fourth-year "Architecture of the City" studio. Here, the form of the city is based in the invention and the art of siting singularly authored, poetic works of architecture within the city plan. The projects require the author/ architect to envision a simultaneously specific and ideal architectural work for the collective and for their time, which is drawn and modeled at a detailed architectural scale. These attributes present a studio discipline taught as the architectural art of the city, as opposed to planning or urban design. The architects, who comprise the team teaching, hallmark of the Cooper studio education, is represented in each chapter of Open City. Each chapter is introduced with a final exhibition installation photograph, the brief of the project “as given,” and an introductory essay from one of the studio professors from the team of practicing architects and historians engaged in this study. Each chapter frames a different problem given to address the contemporary challenges of a city considered as a work of art. Projects confront the challenge of relating the architectural urbanism of “Rome/Berlin/NY”, study “Cities of Catastrophe and their architectural solutions in regard to New Orleans”, present the concept “Vuotare,” the art of creating voids in the urban fabric, or question “Autonomies”, the architectural outcome of the spatial theories of the artist Lucio Fontana. The interdisciplinary richness of these studios is illuminated by essays contributed by a selection of scholars who joined the critiques, such as Monika Pessler, Francesco Pellizzi and Mary Stieber, as well as a range of architectural colleagues and artists: Mack Scogin, Merrill Elam, William Singer, Catherine Ann Somerville Venart. Careful thought from architects on the Cooper faculty with perspectives on the periods and the themes of Open City is reflected in essays by David Turnbull, Sam Anderson, Guido Zuliani, and David Gersten. This book demonstrates the poetic dimension of taking on pressing contemporary problems of the city with a philosophy deeply rooted in the “architecture of the city” consciousness that has been derived and shared by the past 40 years of Cooper architects with architects of international repute who have considered the question of the existential presence of the architect in the collective work of the civic domain. The project description written by each student to accompany the drawings and models, reveal that the studios required that these existential concerns be voiced parallel to establishing such objectives as an integration of housing and civic architecture after Hurricane Katrina, or follow the significance of the World Trade Center disaster to conceive and determine sites for civic institutions in such major cities as Rome, Berlin and New York. These studios conducted by Professor Lewis at Cooper Union provide a unique record of the young alumni, who are currently practicing and teaching internationally. They have created a vision with impact; an illumination of provocative and generative conditions in existing cities and the projection and extension of great works of architecture as site-specific civic projects with unconventional, inventive, humanitarian programs for our epoch. 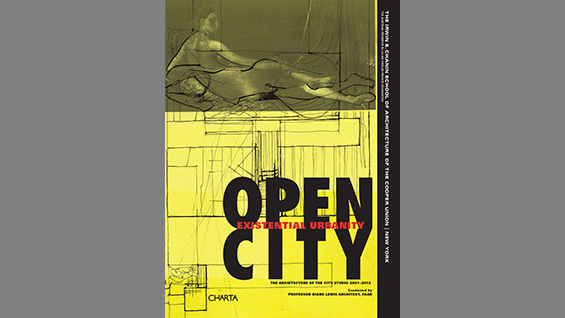 Open City was published in part with a gift of the Austrian Frederick and Lillian Kiesler Private Foundation’s first Young Kiesler Award in recognition of a philosophical bond between the work of Frederick Kiesler and the spirit of the studio endeavors conducted by Professor Lewis. Additional awards and grants from The Cooper Union, the Schubert Family Foundation, Sciame Construction LLC, Pritzker Foundation, Francois de Menil and a number of Cooper architecture alumni were received for this publication, with the focus on a continuity with the refined expression of the rich architectural accomplishment that our two previous books disseminated, and to reiterate the commitment to architectural inventiveness, civic inspiration and responsibility that identify the character of the architecture from this New York City perspective.